Launch in London of 'soldiers of character' research results, using the new Army Intermediate Concept Measure. 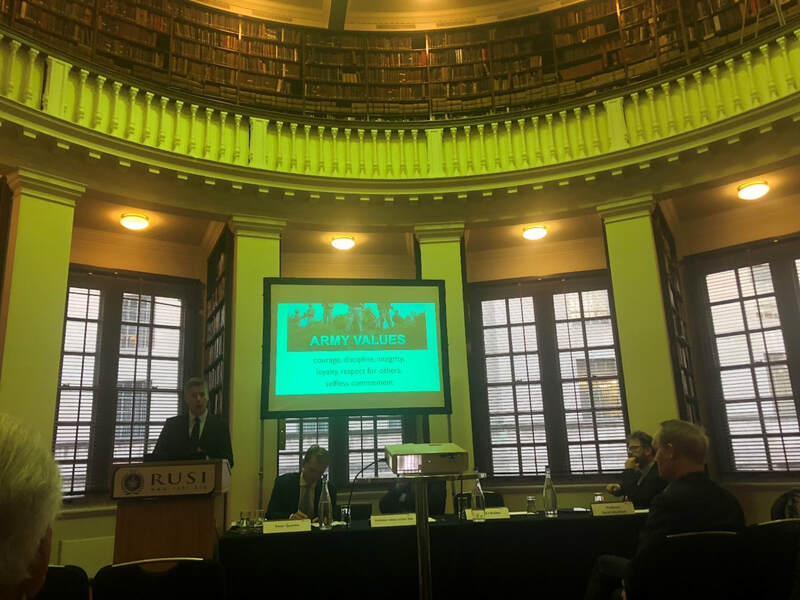 Presentation of Army Research at Royal United Services Institute London. The University of Oklahoma, with a generous grant from the Templeton Religion Trust, is pleased to announce a Request for Proposals (RFP) on the topics of “The Self, Virtue, and Public Life.” The full RFP is available at: https://selfvirtueandpubliclife.com/initiatives/grants/. To support innovative research on the self, virtue, and public life. To encourage methodological innovation in the study of the self, virtue, and public life. To encourage interdisciplinary teamwork, specifically between social sciences and humanities, though scientists from other areas, such as neuroscience and the health sciences, are also welcome to apply with collaborators from the humanities. A subsidiary aim is to support scholars who are new to the investigation of these topics or have not received funding elsewhere. Research collaborations between younger and more established scholars are especially encouraged. The central research themes we seek to explore through this RFP can be framed at the level of the civic virtues of individuals, as well as at the level of institutions. For a list of possible research questions, please see the full RFP. Research into character and virtue is often conducted by scholars within a single disciplinary perspective – philosophers research by themselves, psychologists team up with each other, historians and anthropologists proceed from their own disciplinary perspectives. This disciplinary isolationism is not maximally productive of new knowledge about virtue. To ensure that research funded by this proposal closes the disciplinary gap, funded research teams must meet the requirement of “deep integration,” as explained in the full RFP (https://selfvirtueandpubliclife.com/initiatives/grants/). Awards are intended to support research from August 1, 2019, through May 31, 2021. Letters of intent are due no later than December 1, 2018 at 11:59 PM, and must be submitted via an online portal linked to the project website. Full proposals are by invitation only and are due no later than March 15, 2019, at 11:59 PM. Further information is available in the full RFP, on our project website, and by contacting us by e-mail.